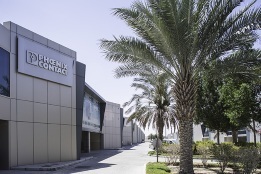 With its future-oriented connection technology, Phoenix Contact is your key partner on the journey to the smart factory, a digital factory. While Phoenix Contact is by your side, you are ideally prepared for the digital transformation: become an Industrie 4.0 company. We cover the Hannover Messe news with multiple videos every day during the industrial fair on our YouTube channel. Find out what our CEO Frank Stührenberg says about combining innovative ideas and technical innovation with new business models in order to be a reliable partner for our customers. Due to digitalization, we are experiencing sweeping changes. In the face of this, only those who grasp the opportunities and explore these new horizons will be successful. At the heart of digitalization is the intelligent networking of business processes, systems, components, of all things and people. As a result, this networking creates new autonomous self-optimizing systems with enormous potential for enhanced efficiency and productivity. Furthermore, Phoenix Contact is already exploiting this potential in in-house applications. Based on the experiences gained from this work, we are developing new products and solutions that will support you on your journey toward digitalization. Our Highlights 2018 brochure provides you with a few examples: from smart connectors, through to our control platform for the digital future, and easy access to the cloud. Push-in connection technology – one for all! Thanks to push-in connection technology from Phoenix Contact, you can wire your entire application easily and without tools. A complete product range is available for consistent wiring from the field to power wiring and the controller. Without tools, you can easily contact sensors and actuators, modular terminal blocks, INTERFACE, and automation components. Push-in connection technology was developed for direct conductor connection, so this means that without any tools, you can insert solid conductors or conductors with ferrules into the conductor connection. In addition, the special spring profile enables effortless insertion of conductors with ferrules of 0.25 mm² or more. The contact spring opens automatically when the conductor is pushed in and thereby provides the required pressure force against the current bar. The spring opens by an actuation lever either to release conductors or connect stranded conductors without ferrule from 0.14 mm² without direct contact with live parts. You can operate the actuation lever with all standard screwdrivers.